Inside My Radio sounded like such a nifty idea for a game. 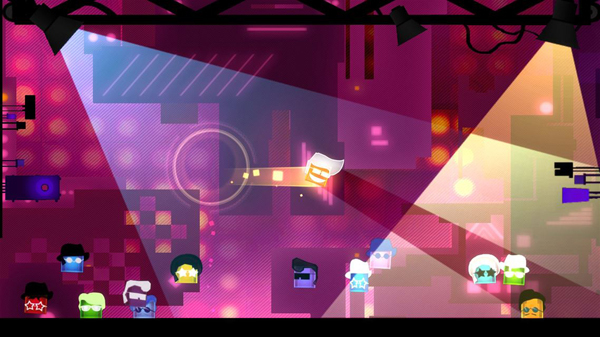 It’s a rhythm-based platformer that has you guiding musical sprites in a TRON-like inner world inside a boombox. The music stages in Rayman Legends were some of my favorite levels to play, so I was down to experience more like that. While novel, Inside My Radio suffers from an uncomfortable disconnect between its platforming action and “move to the rhythm” method of play. There’s little setup needed to get the action going. An ethereal LED is pulled into a 1980s-style stereo that had been left to rot in a dark alley and is beseeched by the relic to restore its music. Such plotting is merely window dressing, a light pretense to get you moving along stages designed with traversal challenges set to different genres of dance music. Inside My Radio differs from other platform games because movement is tied directly to the musical beat. A jump, dash, and power drop move can only be performed on the downbeat, otherwise a pair of X’s flash over the eyes of your sprite. In this sense, the game feels significantly restricted from similar titles that let you jump to your heart’s content. For a game about crossing gaps, avoiding enemies, and tracking moving platforms, having to wait for the down beat becomes more trouble than it’s worth. 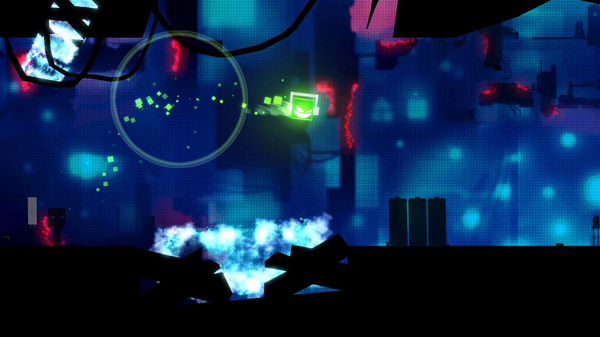 The “this really shouldn’t be this difficult” feeling of getting around wouldn’t be a problem if the levels were designed with the rhythm-centric gameplay in mind. Instead, Inside My Radio feels as if it were developed by two people who understood the premise but worked in separate rooms. While person A was responsible for creating the music portion of the build, person B constructed stages around rudimentary level design that follows the “arena/corridor/arena” formula. There’s a surprising amount of down time in between a stage’s set pieces that involves moving unmolested to the right, dashing through electronic fields, and hopping up and down stairs. The bigger spaces, where much of the tricky navigation takes place, do not take the stage’s music into consideration (something that RaymanLegends did well), thus failing to create a cohesive “feel” between music and gameplay. It makes the adventure more frustrating than it should be and I resented being a slave to the beat. Inside My Radio, as a concept, sounds more enjoyable than its execution. If the “move to the beat” nature of the game were implemented elsewhere, I might have enjoyed it. The disconnect between music and gameplay is noticeable because the two don’t play well together. The music itself isn’t particularly memorable and even though it offers different genres (though mostly those that allow for a loud, thumping beat), the soundtrack doesn’t go out of its way to be special. A fun idea on paper, Inside My Radio might benefit from a trip back to the drawing board. Trying to get through a level is a daunting experience, and I found myself rage quitting more and more. In the end, I made the decision to stop playing because my time is more valuable than slamming my head against a brick wall of a game. Your mileage may vary, of course, though be aware that Rise & Shine hides an unforgiving game underneath its gorgeous exterior. It is surprising then to see a video game in 2017, an era marked by companies vying to create the “world’s most powerful console,” forgo intense photorealism for muted colors and film scratches (then again, it’s not uncommon for indie titles to employ striking art styles). Cuphead, developed by Studio MDHR Studios, exists on a whole other level as a lovingly crafted homage to an animation pioneer. There’s fun to be had and things to like in Unruly Heroes, though there are moments I felt where the gameplay and mechanics had an annoying habit of getting in the way. Inside My Radio is a brief, interesting romp that never lives up to the potential it enters with. The first few levels will leave you feeling excited to see what’s next but there really isn’t much to see. The cards are on the table after level two and there aren’t any surprises to be had after that. For a game that looks and sounds so fresh and interesting, Inside My Radio was a disappointing experience that left me feeling unsatisfied and underwhelmed.